South East Queensland’s emerging metropolis, stretching from Brisbane to Byron Bay is a sustained centre of high growth, attracting both residents and diverse business investment from across Australia and the globe. The city of the Gold Coast is at the precipice of renewed energy and a coming of age, with traditional and emerging industry sectors flourishing as the cornerstones of this world class city. CBDRobina is central to this shift with an enviable location just a 10-minute drive from famous Gold Coast beaches. 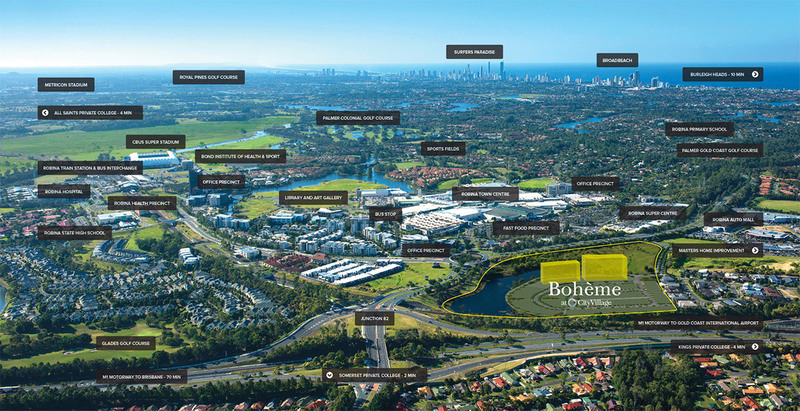 Recognised as a Principle Activity Centre under State Government and City Council Regional Economic Plans, CBD Robina is a vital asset in Gold Coast City’s drive to further develop a high value adding export-orientated economic base. 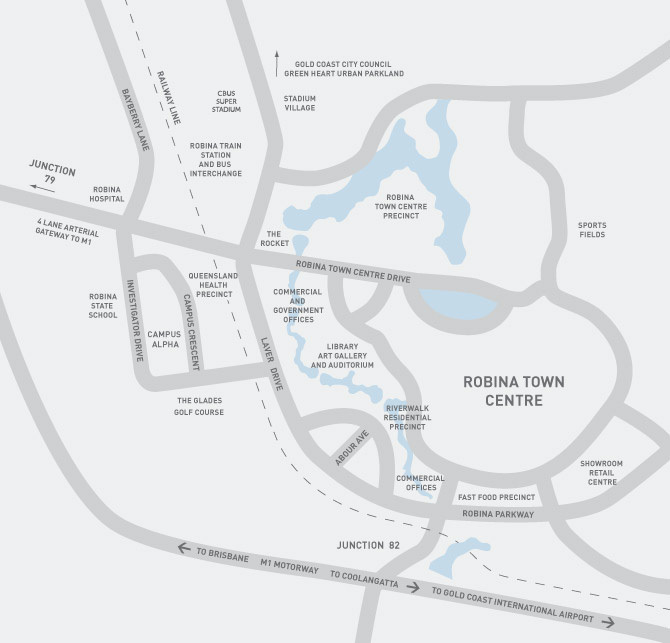 Robina has vast education facilities from childcare and public primary and high schools, a trade college as well as some of Queensland’s top private schools and Australia’s leading university. 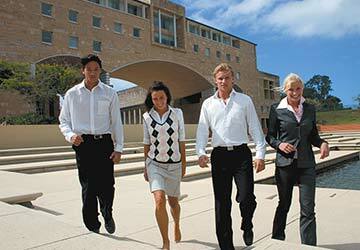 Located at Robina, Bond University attracts a large number of Australian and international students. CBDRobina is an unrivalled retail destination and the city’s premier shopping, dining and entertainment destination with a range of high end and boutique stores. 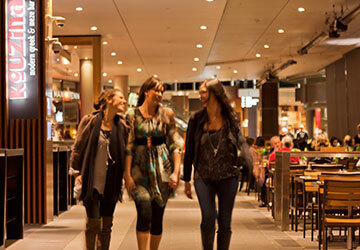 Tenants include Myer, David Jones, Myer, Nike, Rip Curl, Apple, Coles and Woolworths and more than 350 specialty stores, restaurants, cafes and cinemas. 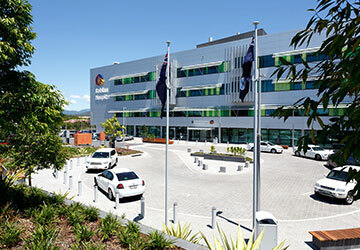 The expanded Robina Hospital and the recently completed Robina Health Precinct anchor the rapidly emerging Robina Medical Hub. Robina Hospital has doubled in size and now offers a wider range of health services. 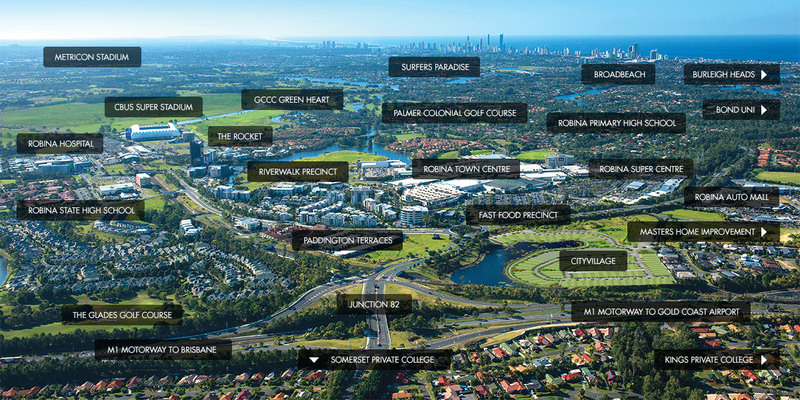 Easy access to the precinct from Robina Train Station. 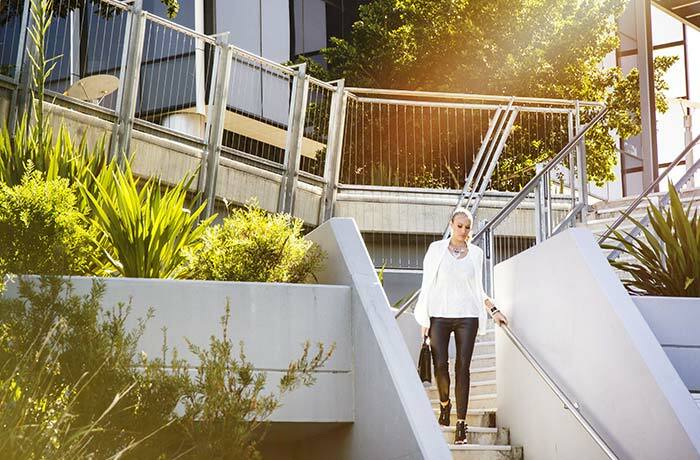 Ease of access, flow and momentum is assured at CBD Robina. 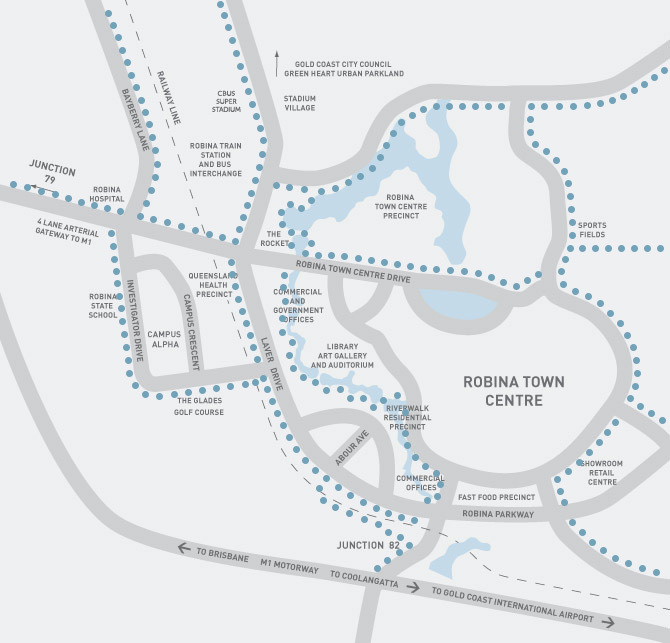 A network of picturesque walking and cycling paths connects well-planned transport infrastructure giving efficient access for residents, customers and Robina’s quickly expanding workforce. Robina Train Station connects directly to Brisbane and both Brisbane International and Domestic airports, with trains running every half hour, many express to the CBD. The station, in a central CBD Robina location, is an enjoyable walk from most parts of Robina with direct footbridge access to Cbus Super Stadium – home to National Rugby League franchise the Gold Coast Titans. Robina Bus Interchange connects travellers to all suburbs of the Gold Coast and hinterland and to Byron Bay. Located at Robina Train Station, buses are scheduled to meet passengers at train arrival times ensuring a smooth transition. 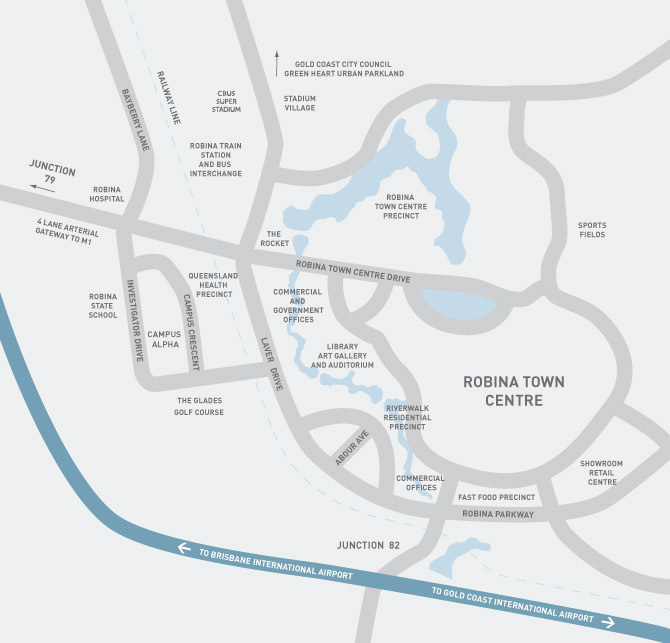 Robina’s central location, proximity to the M1 Motorway and excellent arterial road network enables ease of access and reduced travel times. 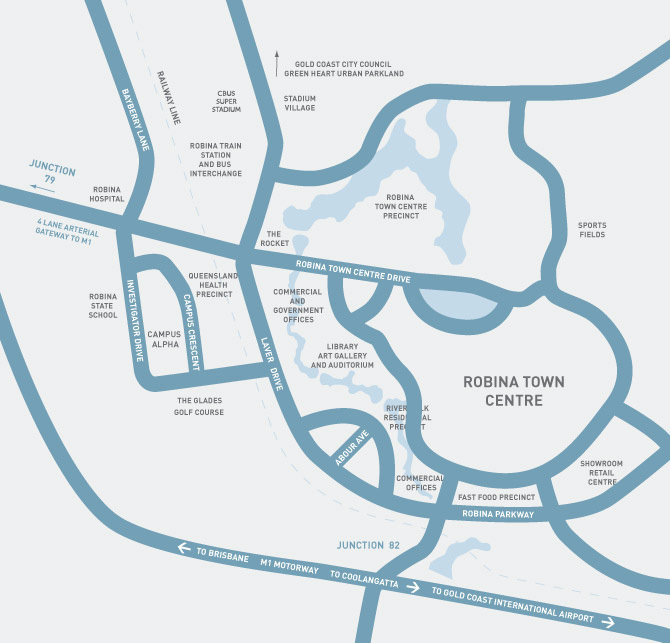 Dual motorway junctions give Robina direct and easy access to the M1. A master-planned arterial road network extends out from Robina across the wider Gold Coast offering quick access and favourable drive times to South East Queensland and Northern New South Wales. Robina is linked with an abundance of waterside walkways, picturesque parklands and cycle pathways, perfect for cycling, walking and running. CBD Robina has developed a distinct and unique character within the heart of the Gold Coast and has become a significant centre of investment in the bustling South East Queensland economy. A shopping, entertainment and lifestyle magnet, it is redefining modern master-planned living. A diverse range of living options including apartments, detached houses and terrace homes are integrated into this master-planned landscape. Wide, tree-lined streets and waterside vistas create visually appealing pockets amongst commercial centres and residential areas. Direct pedestrian access to retail, restaurant and entertainment options offer residents convenience and employment opportunities. All residential conveniences are close by including golf courses, library, Medicare, banks, post office, doctors, cinemas, gyms and a choice of supermarkets and other fresh food options. 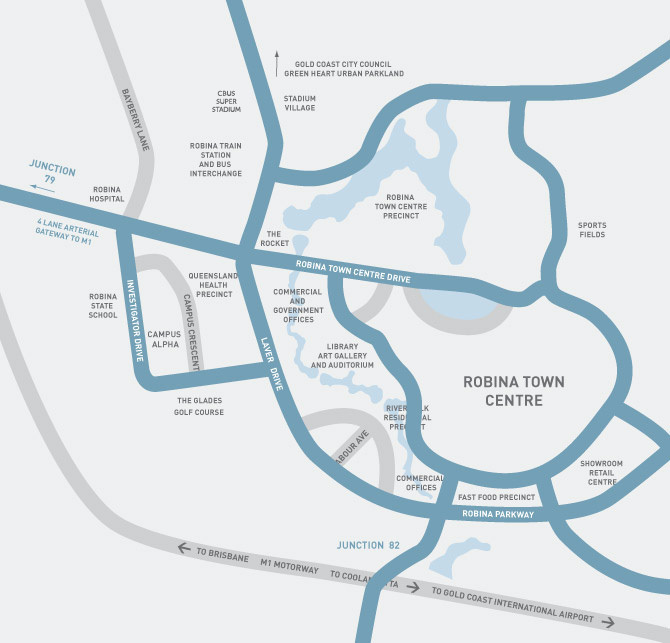 With an established and growing business precinct surrounded by natural waterways, bicycle paths, landscaped walkways and recreational spaces, sought-after Robina offers a high level of staff amenity and lifestyle benefits to the CBD Robina workforce and its loyal customers. A diverse range of commercial spaces are available to suit many uses including corporate, public service, medical, education, food and retail.